After tackling healthcare topics such as computerized physician order entry and tele-ICU, national health policy organization NEHI has taken on chronic disease in its latest research foray. 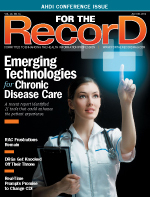 Focusing on various underadopted high-value tools, the report “Getting to Value: Eleven Chronic Disease Technologies to Watch,” published with support from the California HealthCare Foundation, seeks to identify the technologies with the greatest potential to improve care and lower costs for patients, providers, and payers. • Extended care e-visits: These technologies allow physicians to consult with nursing home patients without having to physically make routine visits to extended-care facilities. It’s a time-saver for busy doctors who spend a lot of time maintaining their regular practice. “As a result, most patients receive physician care in a hospital setting, often resulting in overuse of the emergency department among the elderly. A survey of physicians revealed the startling reality that nursing home physicians spend, on average, less than two hours per week on site,” according to the report. These e-visit technologies, including those offered by PhoneDOCTORx and InTouch Health, address the physician shortage challenge by providing 24/7 coverage with voice and/or videoconference functionality, connecting a physician hub to nursing home residents at their bedside. Using these technologies, which include Bosch’s Health Buddy and Philips’ TeleStation, patients compile and then transmit certain health data (relevant to their disease and/or health state) from their homes to physician offices. Physicians will then give the patient individualized education and recommendations based on those data. • Telestroke care: Currently the third leading cause of death for Americans, stroke affects almost 800,000 people each year, which is why NEHI believes telestroke technology has such huge life-saving potential. Two telestroke products currently on the market include the REACH telestroke application and InTouch Health’s Telestroke Networks. • Mobile clinical decision support: This technology, which includes Health eVillages, Clinical Pharmacology Mobile, and NaviNet Mobile Connect as well as smartphones and other mobile devices, addresses the pervasive problem healthcare providers often face of not having accurate, up-to-date information at the point of care. As the report authors note, this problem is relevant for providers in primary care, ambulatory care, and other settings but is especially critical in emergency situations. The report authors noted that various mobile clinical decision-support solutions are currently on the market but expect more growth as other healthcare sectors, such as nursing, pharmacies, and managed care agencies, take advantage of the technology’s ability to provide the necessary information to effectively evaluate, diagnose, and manage patient care. By giving patients access to e-consultations, e-prescriptions, and EHR data with an Internet-enabled computer or a smartphone, virtual visits allow patients to take control of their chronic disease before complications and costly interventions present. Financial concerns are inhibiting widespread use of class 1 and 2 technologies, Bartolini says. “For many of the class 1 and 2 technologies, reimbursement is the biggest barrier to adoption. Because many of these technologies take care out of the doctor’s office and into patient’s homes, the fee-for-service payment model does not adequately incentivize their use,” she says. Class 3 technologies, those with slightly more barriers to adoption or less evidence available, include medication adherence tools designed to help patients take their drugs as prescribed (something up to one-half of patients don’t currently do). These tools, such as cell phone apps with medication reminders, “represent an opportunity to save hundreds of billions of dollars,” according to the report. Mobile asthma management tools aim to “empower patients to better understand where and what triggers asthma attacks in order to prevent and manage complications,” Bartolini says. Examples of these tools include GPS attachments to inhalers that record information about the whens and wheres of its use and early warning software. Mobile diabetes management tools take the same premise and translate it to another chronic condition, allowing any of the 25.6 million diabetes patients in the United States to better manage their disease through mobile devices that can log and collect blood glucose readings, provide real-time alerts and reminders, and even interpret data trends over time. While most of these technologies address different barriers to care for chronic diseases, Bartolini sees certain similarities in them as well. One similarity that stands out is mHealth, which she says is assuming a bigger role in patient care, especially self-care.